In those long ago days before cellphones, speed dialing, and stored numbers, folks like Tommy Tutone telephoned girls like ‘Jenny’ by actually dialing 867-5309. If he was a modern type, he may have even punched the number into the telephone’s touchtone keypad, an innovation that was several years old by the time the song was released in 1981. And, 20 years earlier, in 1962, Gladys Horton and the Marvelettes sang of a woman who urged men to call her at BEechwood 4-5789 so they could “have a date, any ol’ time”. A generation before, in 1940, Glenn Miller and his Orchestra, memorialized the phone number of Manhattan’s Hotel Pennsylvania with the song PEnnsylvania 6-5000. Do you find it easier to remember the telephone numbers of your childhood home or friends, than those of any one of the ten cellphones and landlines in your family today? There was something about dialing a telephone number (or even punching it into a touchtone number pad) that helped commit it to memory. The idea behind central office names, beyond helping memories and expanding the pool of available numbers, was to enable ‘wide range dialing’, or allowing people to dial American and Canadian numbers directly into their telephones, without the assistance of an operator. 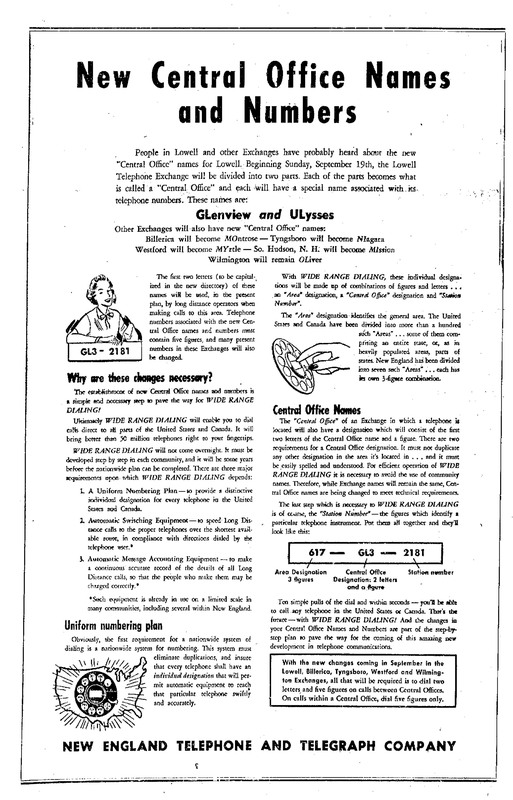 The new system also standardized the numbering system and ensured that each telephone received a unique number. 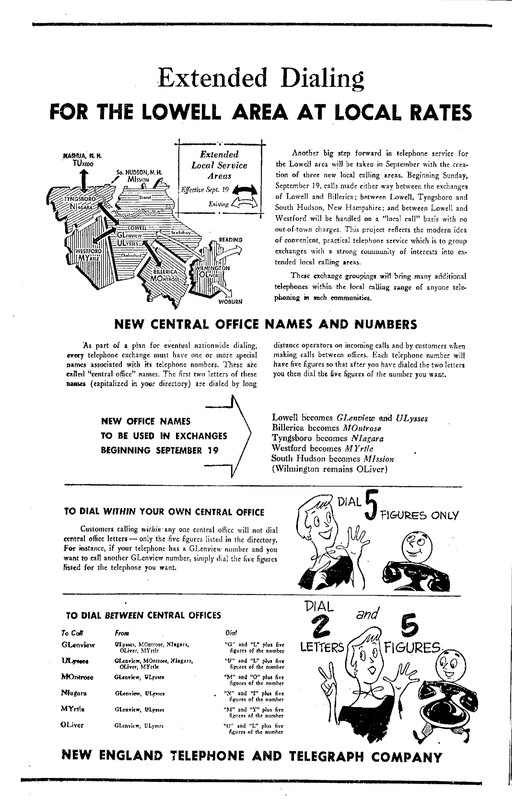 Under this system, telephone numbers contained three components: an area designation (now known as an area code), a Central Office designation (consisting of the first two letters of the central office name and the first number thereafter, and the station number (or the last four digits of the telephone number). So, how did it work? If you were dialing within a central office (or telephone exchange name), you needed only to dial the five figures, as explained above. If you wanted to call outside of your central office, the two letters were added. 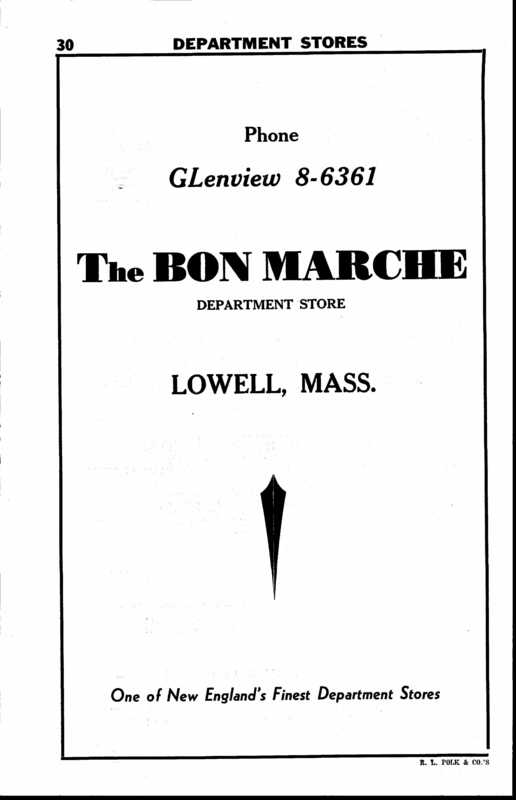 There’s something nostalgic and ‘mid-century sounding’ to a phone number like BEechwood 45789, or more locally, GLenview 8-6361, which was the telephone number to reach one of Lowell’s largest department stores, the Bon Marché. Today, in an era of Skype and email and text messages, it’s hard to imagine the same sort of nostalgia being attached to a phone number. Those short numbers had a bit of a ring to them, easy to see why a song could be written about one. Imagine a song about a mobile phone number or an email address! I still remember my phone number as a kid in the 60’s. My friend next door only had to dial 5 digits to call me. Interestingly, even though it was a Lowell exchange, I lived in Chelmsford, East Chelmsford, which I think still has a Lowell exchange. I always felt weird in school because everyone else had a phone number beginning with 25, or AL. We moved from that section in ’72 and I finally had a phone number beginning with 25. I just looked up my old neighbors’ number, because they still live there, and their number hasn’t changed! ‘How many cookies did Andrew eat? Mark – that’s a great jingle – I had never heard it, and yet it’s been stuck in my head today. Karen – I’ll have to look up when ALpine was assigned to Chelmsford; I thought it had been there all along, but, in researching this post, it looks like the original exchange assigned to Chelmsford was GLenview. Metan – I still remember my grandparents’ number since my folks still have it. I don’t know when exactly they got it, but I know it was the first number they had. I love the 80’s, Ryan, so thanks for posting that Tommy Tutone tune– as well as the great Glenn Miller one too, of course. With the increasing necessity of area codes, phone numbers are getting even longer! Old Needham (Mass.) exchanges are 444- or 449-, which were originally HIghland. And the image from the Glenn Miller song reminds me that my mother still has an old rotary-dial phone that works! It came from my father’s mother’s home. Although the central office names were before my time, we were able to dial a 5 digit local call up until the early 80s. Acton’s central office name was was COlonial. Concord’s was EMerson. GL8-6219, I remember it to this day. It was also a “party Line” . Mom and Dad probably paid a lower rate for a shared connection. Correct me if I’m wrong but i think the ring pattern, three short, two long or something like that..determined if it was a call for our house or the next door neighbor’s. Good thing we got along well with them and no one minded too much if we listened in on a conversation every once in awhile. A few days ago, a friend of my daughter’s asked ‘what’s a home phone?’ I was able to explain that pretty easily, but party lines might just be too foreign a concept in this age of instant, always-on communication.